Students test a hypothesis regarding the buoyancy of a watermelon in an after school STEM program. Sail Sand Point incorporates Science, Technology, Engineering, Math education into nearly all of our programs. We have worked with US Sailing’s STEM Education Initiative, REACH, to create kid-friendly, sailing-related modules that are used in camps and classes throughout the year. 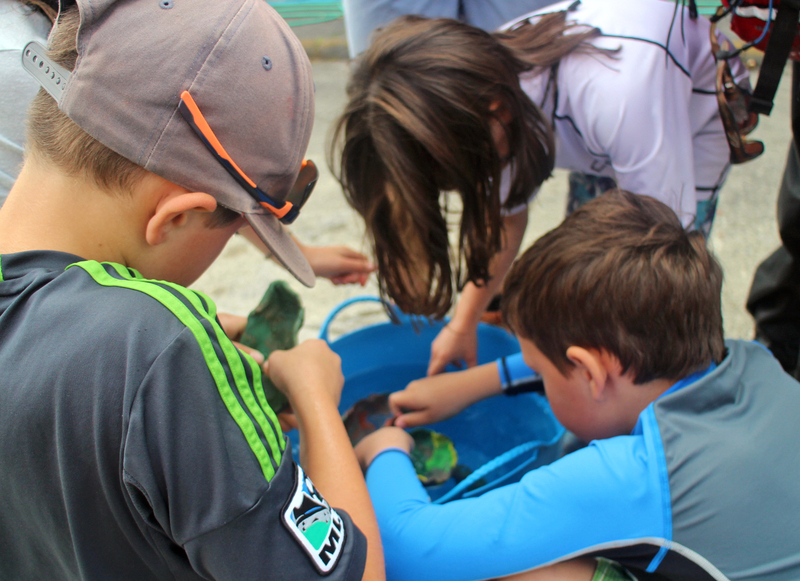 Because of Sail Sand Point’s unique geographic location, we have the opportunity to modify some of the STEM modules to incorporate our local ecosystem into lessons, making the learning experience more immersive and relevant to our students. As part of our development of STEM programming we have developed a six week after school STEM sailing program which is offered in the spring and fall. This program is available to our many partners including the YMCA, Boys & Girls Clubs, and Community Centers. Additionally, we offer full week STEM-focused camps in the summer that coordinate with NOAA. Through our STEM programs, we have been able to reach kids who may not have previously found science and math interesting. We have had the opportunity to see first-hand, that when STEM is coupled with on-the-water experience, our young sailors are able to see how science and math fit into their everyday lives in a very exciting and tangible way. If you have ideas for STEM lessons that could be taught to young sailors, or if you have a program that would like to participate our STEM program, let us know! Contact info@sailsandpoint.org. As part of one module on buoyancy, sailors experiment with different clay hull forms. The goal is to shape a boat that can hold the most marbles while floating.